If you follow me on Instagram, then you know it was +40C a couple of days ago in Dubai. Add 80% the humidity and it feels like +60C. Now you can imagine, that when I went out to meet up with a friend I felt like I’d been in a steamer room. Generally over the half of summer lasts in this way; don’t know what has happened this year but I remember only few humid days.. What was I talking about? Ahhh, I got fresh figs! I remember the very fist time when I have tried them. 😀 Figs aren’t often sold here, especially for affordable price, so I prefer to consume them as is or in a simple salad: figs-prosciutto-nuts-arugula. But you know what? I wanted a pie or tart. It’s a normal thing for me, I always have a craving for pies! 😀 Desire and lack of butter did the job: you can see my sweet creation! 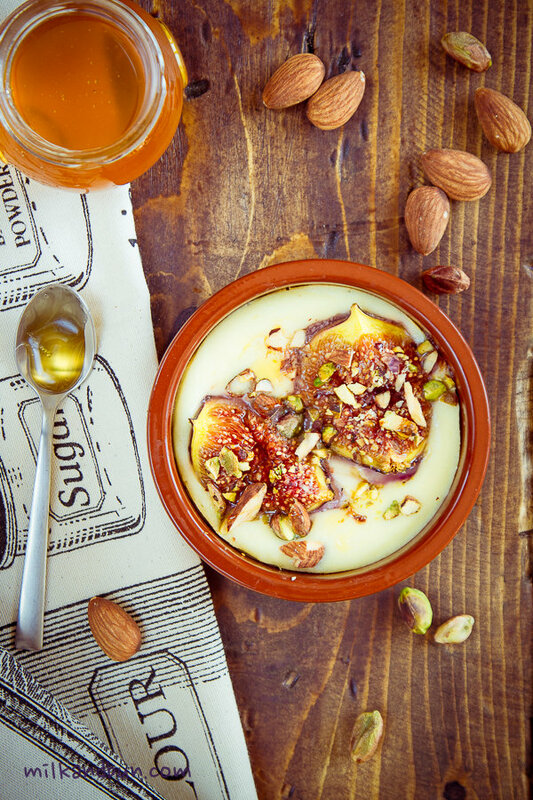 Sweet figs baked in a smooth and delicate ricotta cream, topped with chopped pistachios&almonds and drizzled with honey! That’s what we have here. Make a ‘x’ cut in each fig or cut into fourths. Drizzle with cognac and lemon juice. Leave to marinate for 10-15 minutes. In a bowl, beat eggs with sugar and vanilla. Mix in ricotta. Divide the ricotta cream between two baking dishes, or pour into one. Arrange figs on top. Sprinkle with nuts. Bake in preheated 200C oven for 15 minutes. Drizzle with honey. Serve warm. 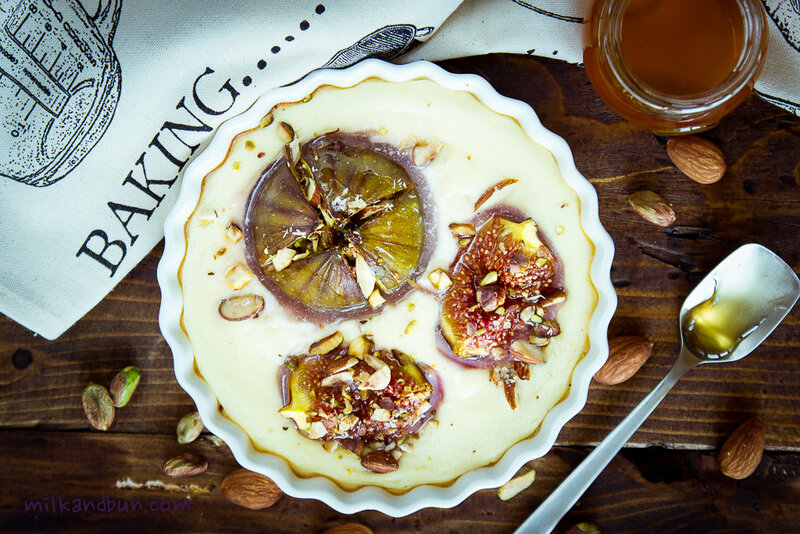 Sep4September 4, 2015 • By milkandbun • This entry was posted in Baking, Desserts, Midweek Meals and tagged baked figs, cooking, delicious, dessert, easy cooking, figs, food, food photo, food styling, fresh figs, healthy, healthy recipe, photo, recipe, ricotta cream, sweet. Bookmark the permalink. Wow this sounds so delicious!! Hi Ranjana! Speaking honestly, I haven’t tried it without eggs, but I’m sure you can make it – simply omit eggs, and beat ricotta with sugar (you may add vanilla and citrus zest), then follow recipe steps.. Good luck! ok… Also, I am assuming that 6 eggs would provide a lot of moisture to the dish. So maybe something like milk would do the trick in providing moisture? Would you be able to describe how ‘thick’ or ‘thin’ this needs to be before baking? Like pancake batter maybe? I think eggs give extra air and volume to the mixture, the batter was much thicker than for pancakes. Better if you try to add 1 tsp baking soda mixed with 1 tsp lemon juice or vinegar to get desired puff texture/volume. Hope it will work! 🙂 Happy cooking! Of course you can! I had too many quail eggs in my fridge which should be used as soon as possible-that’s why I added them. 🙂 I think 2 medium hen eggs is more than enough. Thanks for linking this up to FF, it’s the perfect party food! Always nice to read a comment from you, Ginger! 🙂 Have a lovely weekend! Loretta, you can use regular eggs: 2 medium or even 1 large. Eggs are not the main point here😊It’s one of the quickest dessert! I’ll give it a try Mila, thanks, I love figs, which is what attracted me to this post. Quail eggs sound quite exotic though, I’m sure I could find them around, I just haven’t tried. That just is a stunning dessert! Wish I could get my hands on fresh figs. Thanks a lot, Mimi! It’s smooth, tender and yummy! 🙂 I’d love to eat figs more often too..
BEAUTIFUL! Looks SO creamy too. Fresh figs are such a special treat. Glad you liked it, Josette! And you are absolutely right, it’s creamy and light. Hahaha Thanks a lot, Stephy! This looks delicious – I love figs as well, and with the sweet ricotta cream must be so tasty as well. Pinned to try at some point! Very unique. Looks tasty too! You made my day! 🙂 Thanks a lot for lovely words!